After watching some curious nest-building activity in Hog Hall over the last 4 days and fearing the return of some less-welcome wildlife.... the very happy news is that 'our' Hoggy has returned following release on 20th December. She is currently snoozing happily back in Hog Hall and looking very plump and healthy. It's not strictly Llangrove 'news' but mention has to be given to the number of hedgehogs residing in the village. 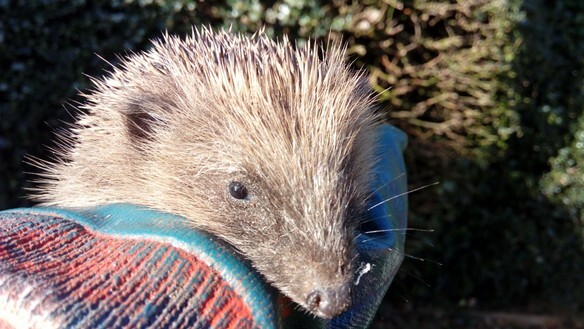 Having seen only one hoggie in the wild since my early childhood in Lancashire, I spotted just one hoggie while living in nearby Ross-on-Wye but since moving to Llangrove, we've been inundated with baby hogs. We first stumbled upon a nest of very vocal young hoglets in our garden shed so left them undisturbed while monitoring mum on a series of camera traps both in the shed and around the garden and providing a supply of high protein kitten food, dried mealworms and fresh water. She developed a regular routine of heading out for a stroll at certain times the returning to her family before heading out on a second mission before returning just befor 6am. One morning, however, she went out and she didn't return. We watched and waited, searched the hedgerows and even looked for any squashed prickly piles in the lanes but there were no signs other than a neighbour reporting continued regular hoggie-poop on her lawn. A sigh of relief: mum was fine but the hoglets had been deserted yet we knew from the camera traps they were too young and too small to survive hibernation. Then followed nights of prowling the garden in search of the youngsters - and we were lucky enough to find some of the litter, bring them indoors for warmth and feeding then pass them onto a local rescue. He liked to climb up my arm and try to squeeze up sleeves - which tickles! We are now down to just one hoggy living in kitchen who is almost up to a safe hibernation weight and will make him a hoggy house then pop him out to hibernate and live in hope that he will be safe through the winter. After 2 months with us, we've grown rather fond of him. He has his own routine, waits patiently for his feeds then crawls out for his feast before returning to his nestbox for a snooze. Arrangements have been made for the smaller hoglets to be returned to us next year. They are too small to hibernate so will be kept awake through the winter and then returned to us in the spring where hopefully they will have their own families next year.